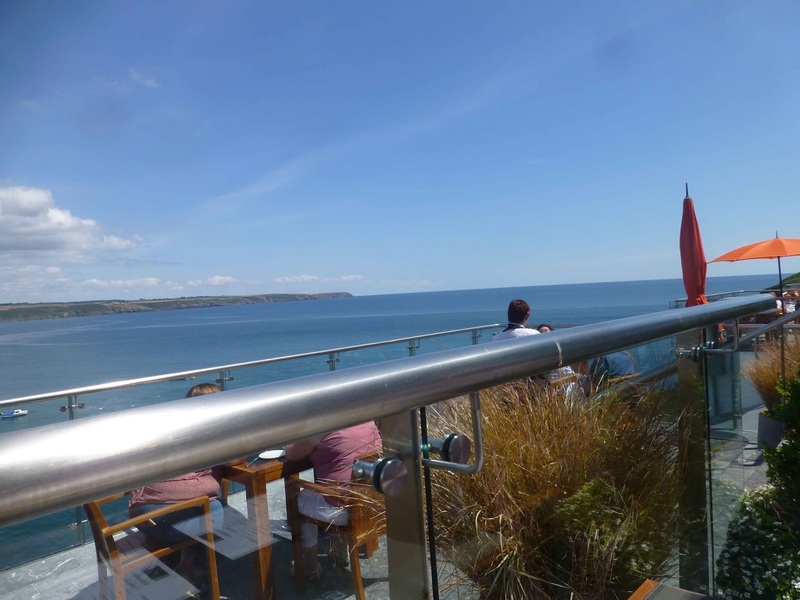 RESTAURANTS AND FOOD: Cliff House Hotel. New Menu. Bar above. Sea below. Cliff House Hotel. New Menu. Bar above. Sea below. Cliff House Hotel. New Menu. Some people wanted a table in the sun. Some preferred to be in the shade. And a few stayed indoors. We were on the terrace at The Bar in the Cliff House on one of the sunniest days of this sunny summer. Earlier we had been walking on the Waterford Greenway and so we two settled for a place in the semi-shade to try out the new bar menu at this superbly situated hotel. A glass of Rebel Red and lots of water helped cool things down as we studied that inviting menu, divided into sections: From the Garden, From the Land, From the Sea, Irish beef from McGrath’s and Sheelin, Small Bites and Snacks, Sides, and Desserts. And also a Dish of the Day. This superb well-priced menu is served 12 noon to 4.00pm and 6.00pm to 9.00pm. Service, we noticed, is rather leisurely here. 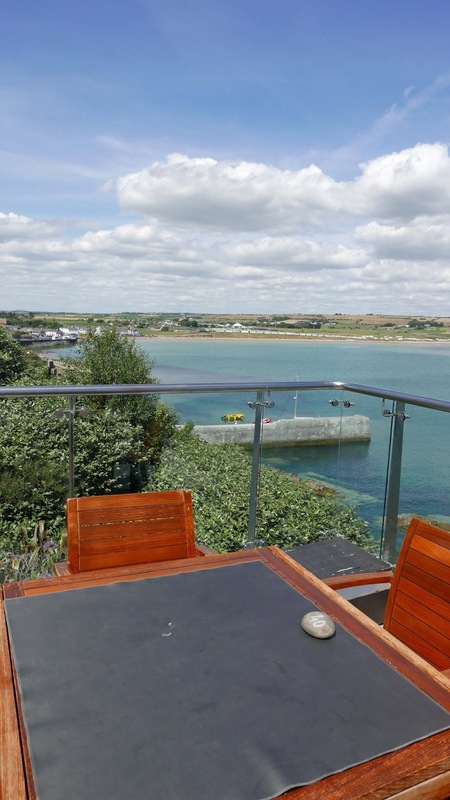 In any case, it is the kind of spot you come to slow down, take in the fantastic views out to the ocean and back towards the curve of Ardmore beach. 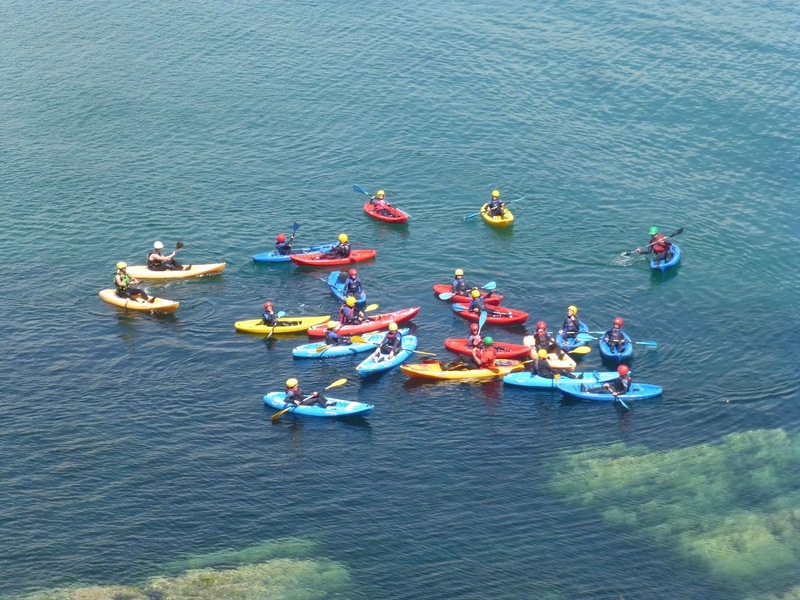 A “school” of young wanna-be sailors gather below at the base of the cliff and add a riot of colour. Who’s in a rush? So, eager to try out as much as possible, we pick and choose from under the various headings. 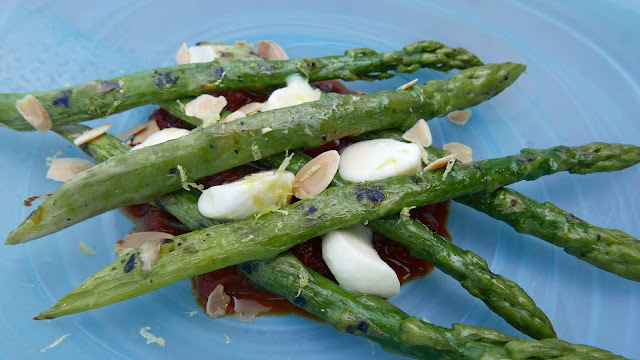 My Green Asparagus Peperonata, Burrata, Almonds (9.75) comes from the Garden, maybe the Garden of Eden it is so tempting, so delicious. Oysters, Iberico Ham and Organic Olives come under the Small Bites and Snacks section. 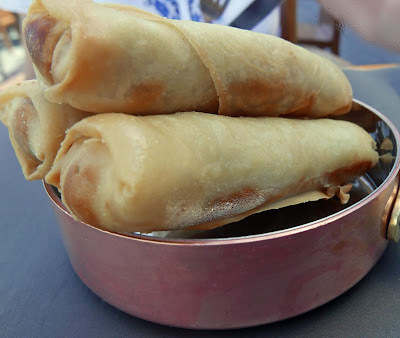 So the Official Blog Chef (OBC) gets a surprise when she sees no less than three Skeaghanore Duck Spring Rolls (7.50) arrive. 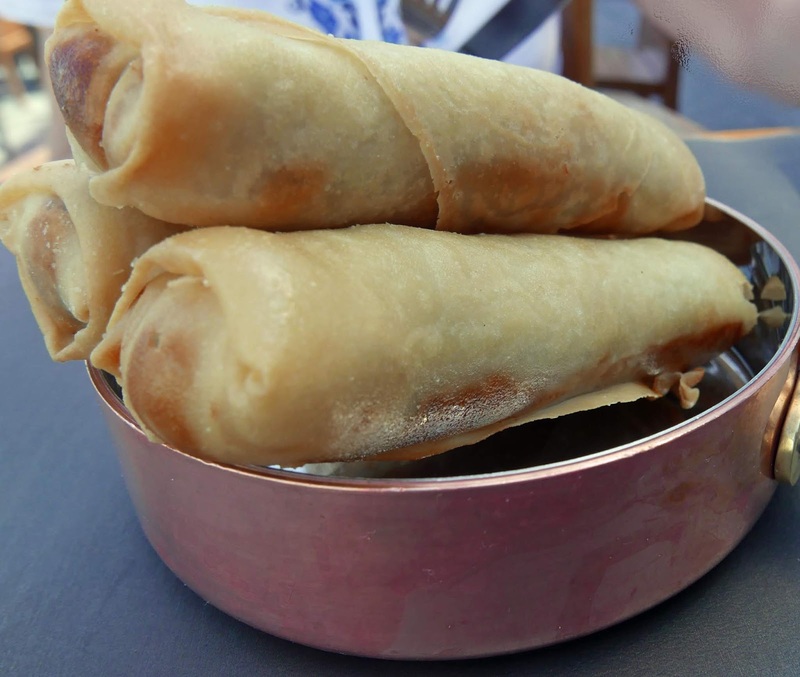 And they are packed with that renowned duck meat, rich and satisfying. She feels the energy lost on the Greenway flowing back! A bit of a gap between round one and two. But the second phase is just as impressive. 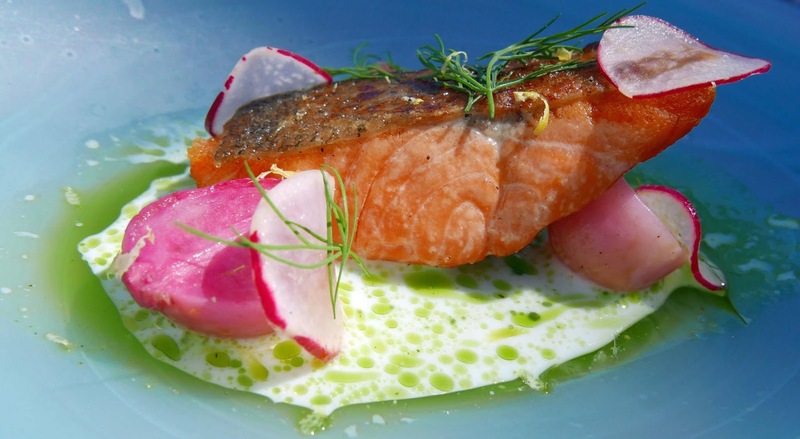 My pick, From the Sea, is the Organic Irish Smoked Salmon (12.50 small & 21.50) Mi-Cuit, Buttermilk, Dill Oil, Radish. I take the starter portion. The quantity is enough and the quality is off the charts. Just superb and the buttermilk, dill oil and radish make a great match with the warm flaky flavoursome fish. Table number on the stone! And it’s thumbs up at the other side of the table also as OBC tucks into the well presented (they are all well presented) Guinea Fowl Terrine Pickled Vegetables, Brioche, Parsley, Mayonnaise (9.50) that comes out of the Land section. The Lemon and Cream pot with Blackwater Gin was calling me from the dessert menu but, having enjoyed a hearty breakfast earlier in the Granville in Waterford, we had had enough and so reluctantly bade goodbye to the lovely crew at The Bar. With so much much delicious food on that menu, we promised ourselves a return visit! After all, the hotel is just 53 minutes from the eastern side of Cork City (and Google Maps often over-estimate). No excuse.